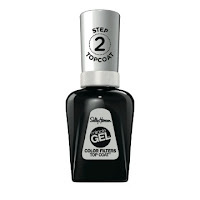 Today I tried another color combo using the a new Sally Hansen Miracle Gel Color Filter Top Coat. Smoulder is really pretty, but I felt I needed 2 coats of it to get even coverage. Achieving new nail color effects is now as easy as putting a filter on it. The award-winning top coat you love from Sally Hansen has been taken to new heights and lights: introducing Miracle Gel™ Color Filters Top Coat™ – Instagram-inspired top coats that instantly transform nail color in just one swipe! The Miracle Gel™ Color Filters Top Coat™ allows you to mix, match and customize to create different shades with a single bottle. Getting an “Insta-worthy” look is easy! Start by using your favorite Miracle Gel shade, and wait for it to dry. For a photo-filter finish, use the Miracle Gel™Color Filters Top Coat™ like you would with your regular Miracle Gel™ Top Coat. For best results, pair with Sally Hansen Miracle Gel™ in Birthday Suit, Pinky Promise, Get Mod, Crème de la Crème, Street Flair or V-Amplified. Miracle Gel™ Color Filters Top Coat™ gives you the look you want without the use of UV/LED light and it removes easily with regular nail polish remover.